The Motor Torpedo Boat can be traced back to the successful 1910 racing yacht Miranda IV which could reach speeds up to 40 knots. This design was scaled up to a 55' Coastal Motor Boat for the Royal Navy during World War I. In 1937, Vosper Ltd. offered the Royal Navy a 69.5' design that it developed in-house and was powered by a trio of Italian Isotta Fraschini Asso engines. This design could cruise at 35 knots and would become the basis for the production MTBs during World War II. One logistical problem arose when the Italian engines were no longer available for some reason and these were eventually substituted for the Packard engines that powered the American PT boats. The Vosper MTB was armed with a pair of 21" torpedo tubes, two .50 caliber and two .303 caliber machine guns, and up to four depth charges. While the Vosper was fast and agile and made good use of those attributes in combat, crews would also make use of its lack of wake and quiet power at low throttle settings allowing the boat to crawl undetected into target-rich environments at night. The kit comes in a large box (just like its predecessors) and on opening the box, you'll be impressed with the protective packaging of the kit. The hull and main deck are mounted into a tray that has folding retainers that securely hold the unit in place with the lid closed. When you remove the folding retainers and tray, you see that the tray was providing another layer of protection for the rest of the parts trees underneath. Molded in light gray styrene, the kit is presented on five parts trees plus the hull and main deck. One fret of photo-etched parts and a sheet of dye-cut clear acetate parts round out the kit. The first thing you'll note in comparison to the other kits that came before this is that the Vosper really liked its port holes. There are 12 in the main hull and another 12 flush-mounted in the deck to illuminate the engine room. While the instructions have you install these at the beginning of the project, the wise modeler will wait and install these at the end of the build and painting to make life much less complicated. The main deck is very nicely detailed which means that after painting, there will be some nice features to provide contrast for weathering and detail painting. The bow hatches are positionable, but if you do pose either of these open, you won't have any detail inside to show so best to leave these closed. The recess in the main deck is the lower portion of the pilot house and the kit provides a complete set of controls and instruments as well a support equipment before the pilot house is enclosed. A duplicate set of controls for driving the boat are mounted at the rear of the pilot house for operations outside/standing. The rear deck is likewise provided with a number of hatches that can be posed open but are best left closed as the pilot house is the only interior fitted to this kit. The deck is fitted with lots of details from vents to cleats and from the two torpedo tubes to the twin-machine-gun turret and the four depth charges. Speaking of torpedo tubes, when you look closely to the support framework of these tubes, you'll see that Italeri has really improved their injection molding technology as the 'C' channels are really nicely done, especially while they are integral to the tube halves without sacrificing detail elsewhere. Very nice indeed. Two torpedoes are also included that will be stuffed into the tubes when completed. A display stand is included in the kit. Like the other kits in this series, the Vosper kit comes with a 24-page booklet that provides a brief history of the type, reference photos of the boat, and color profiles of MTB 77. Markings are provided for MTB 77 with extra numbers included for 73 and 79 though you can probably render others. Just take note to adjust the boat's armament configuration as needed. 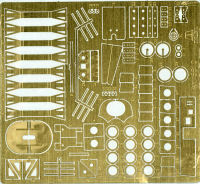 This is another really nice kit and should build up as nicely as PT-596 though this kit is a little less complicated. The use of photo-etch is straightforward and doesn't require very many parts to be either folded or shaped. Since the colors worn on these boats was flat medium gray (according to the instructions) over flat black below the waterline, the basic project is fairly simple but the detailing will provide the AMS modeler with the opportunity for some artistic weathering, washes and highlights to bring this kit to life.